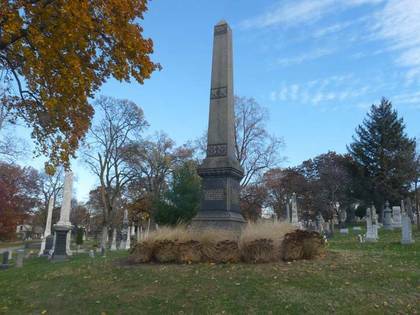 Green-Wood Cemetery was founded in 1838 on 478 acres of rolling acreage in what was to be the neighborhoods of Park Slope and Sunset Park. Its first landscape architect was David Bates Douglass, who rode on horseback all over northern Brooklyn with Henry Pierrepont, one of the founders of Brooklyn’s parks system in order to select the optimum area to build Green-Wood. The cemetery’s peaceful, quiet expanse permits spectacular views of Manhattan in its north and northwestern sections, as its peaks and valleys were graded and flattened only slightly by its creators. This was among the first “rural” cemeteries in New York; most burial grounds in the city prior to this had been associated with churches, with the better-off buried under churches in vaults, the rest in churchyards. As the city marched inexorably northward on Manhattan Island, small burial grounds were displaced and no provision was made for the placement of new cemeteries. The solution was to place them in “outer” localities like Brooklyn and Queens. Their wide open spaces made the cemetery-as-park concept possible. In the latter days of the 19th century and early 20th, cemeteries became parks, with Sunday outings and picnics. Horsecar and railroad routes and schedules became tied to cemeteries’ visiting hours. 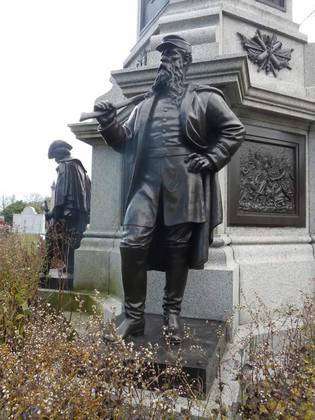 Green-Wood’s thousands of burials include industrialist and educator Peter Cooper, engravers Nathaniel Currier and James Ives, painter and inventor Samuel Morse, newspaperman Horace Greeley, churchman Henry Ward Beecher, crooked Tammany politician William Marcy “Boss” Tweed, New York State Governor DeWitt Clinton (who died in 1828, but his remains were disinterred from an Albany cemetery and moved to Green-Wood in 1853), and Charles Lewis and his son Louis Comfort Tiffany, the founders of jewelry emporium Tiffany’s and the world’s foremost stained glass artist, respectively. 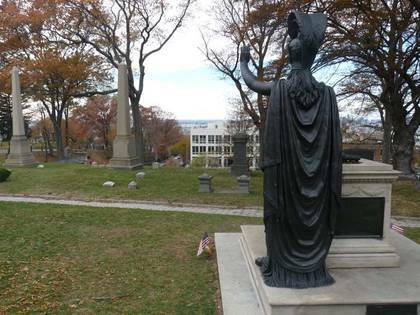 I have given five or six Forgotten New York tours in Green-Wood Cemetery. None was better than the first in the spring of 2006, when nearly forty Forgotten Fans joined me on a spectacular 68-degree April afternoon. One of the aspects of Green-Wood, Woodlawn, or any “cemetery-as-park” is that you need not have any interest in history to enjoy them. You can enter as a horticulturalist, a nature lover, a birder (it still pains me to not type “birdwatcher”) and have just as good a time as anyone else hunting down famous people or people you knew. You can be a type enthusiast, as gravestones and signage present a plethora of viewing opportunities. Taking the train to a recent Sunday afternoon jaunt in Green-Wood, I exited the subway at the newly-rebuilt Prospect Avenue station, which had been closed for a few months, along with the 53rd and 77th Street stations, so that the MTA could spiff up the stations with new informative signage, wi-fi, mobile device chargers, and artwork such as John Ashbery’s “Train Rising Out of the Sea,” shown here. The new stations are attractive, but I question the MTA throwing a few million here when more important things like antiquated switches could be addressed. I entered Green-Wood through its massive sandstone arch, shown above, at 5th Avenue and 25th Street. It was created by famed ecclesiastical architect Richard Upjohn and built between 1861 and 1863. It boasts rich detailing such as three spires, religious reliefs with a Resurrection theme, and a bell that rings to announce every funeral procession. Also note that a colony of monk parrots has made its home in the central tower: you will see a bright flash of green now and then while regarding it; the parrots’ cheerful calls interrupt Green-Wood’s silence in the main gate’s vicinity. Though the Cemetery is spectacular in spring and fall, when it is wild with color from blooming and later decaying foliage, the colors were muted this year because of a mild autumn. And, though the weather was bright and sunny when I exited the subway, a low cloud deck soon settled overhead, making Green-Wood very austere and sullen in appearance, to match my own mood as I continue to fruitlessly pursue full-time work. But a visit here always perks me up as there is always something new to discover. Time is always of the essence, as most gates except the front at 5th Avenue close at 4 PM. Today, I stuck to the Cemetery’s northern tier. There is never an excuse to get lost, as maps are available at the Cemetery office and often on carts outside if the office is closed. The Brooklyn Theatre at Johnson and Washington Streets was packed the night of Tuesday, December 5, 1876, for a performance of The Two Orphans starring the popular Kate Claxton, who was known as the “Sarah Bernhardt of the USA.” But a fire broke out in the theatre that night, and 278 perished from flames, smoke, and the trampling of a panicked crowd. Claxton herself survived and lived on until 1924, after which she took her place in Green-Wood. The City of Brooklyn arranged for a mass burial for those who had no money for plots of their own and for those whose bodies were burned beyond recognition. 103 people are buried in this plot; they were sent off by a crowd of 2,000 mourners and a German chorus. Shortly after, the City of Brooklyn placed a granite obelisk on the plot. Cadman Plaza now stands on the theatre site. The Soldiers' Monument, erected in 1869, 4 years after the Civil War was won, commemorates the 148,000 soldiers from New York who fought it. The soldier above holds an axe, while 3 others carry a rammer (a device for loading shot into a cannon), a rifle and a sword. 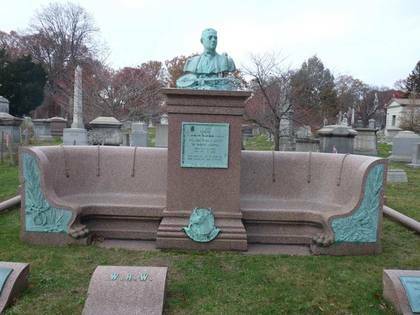 Green-Wood’s Civil War monument followed Queens’ Calvary Cemetery’s war monument by three years, and Flushing’s monument by four. It is among the Cemetery’s more prominent monuments as it is on a high hill and can be seen easily by passersby on 6th Avenue at the bottom of a steep hill. Henry Chadwick (1824-1908) is regarded as “The Father of Baseball.” A sportswriter who became the first baseball editor, he assigned numbers to positions (1-pitcher; 2-catcher; 3-first base, and so forth); invented the terms assist, base hit, base on balls, white wash, double play, and many more. He is enshrined at the Hall of Fame in Cooperstown. 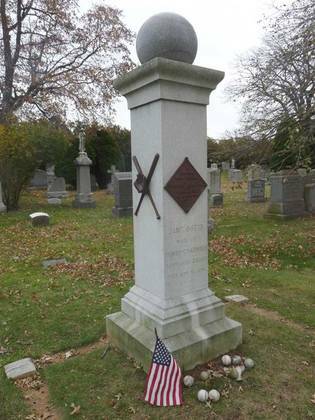 His monument is topped by a granite baseball and has bronze catchers’ mask, bat, ball and glove. The plaque is diamond-shaped, and stone bases define the plot. A couple of baseball diamonds away lies Charles Ebbets, who built the Brooklyn Dodgers’ Ebbets Field (1913-1957). Minerva and the Altar of Liberty was commissioned by ink king Charles Higgins; his company is still going strong and his old mansion still stands on 9th Street between 4th and 5th Avenues. The ink factory, as a matter of fact, stand behind it. Higgins also built his tomb behind Minerva. She stands on a high hill, acknowledging the Statue of Liberty, clearly visible (though not on this hazy day) through carefully pruned trees. Condo developments always threaten the view. “Civic Virtue,” called “Fat Boy” by his detractors, was designed by renowned sculptor Frederick MacMonnies and actually worked on by the famed Piccirilli Brothers of the Bronx, who also sculpted Abraham Lincoln at the Henry Bacon Lincoln Memorial in Washington as well as the two lions, Patience and Fortitude, who guard the NY Public Library at 5th Avenue and 42nd Street. “Civic Virtue” was installed in 1922 directly in front of City Hall. It immediately came under fire from many women, who were angered that the youth portraying ‘Civic Virtue’ was demonstrating his triumph by lording it over two female figures, depicted as sea sirens. For 19 years, the city leadership regretted having him around, especially Fiorello LaGuardia, who apparently despised being mooned by Civic Virtue daily. The Little Flower had the statue shipped off to the remote wilds of Queens at Queens Boulevard and Union Turnpike when Queens built a new Borough Hall there in 1941. In 2012 Civic Virtue again came under fire from Queens Borough President Helen Marshall and, ironically as it turned out, US Representative Anthony Weiner and finally, he was removed from his Queens pedestal and shipped off to a relatively remote area inside Green-Wood, where he was partially restored the following year with a combination of city and Green-Wood funds. William Holbrook Beard (1825-1900) was a popular painter of comedic animal scenes; it was he who first popularized the Wall Street “bulls” and “bears” by depicting them wrestling on the trading floor in an 1879 work. 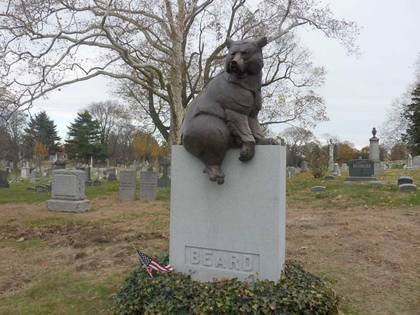 His resting place was unmarked until 2002, when cemetery historian Jeffrey Richman alerted gallery owner Alexander Acevedo, who had presented a retrospective of Beard’s work at his own gallery in 1981, about the absence of a memorial stone. 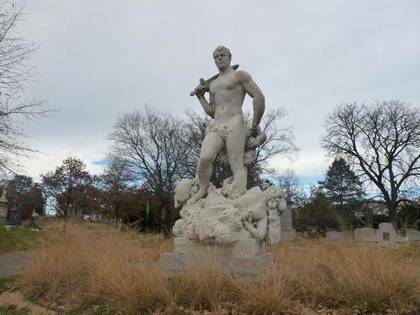 Acevedo took out a two-page advertisement in Antiques magazine soliciting contributions toward ''A Tomb for the Unmarked Well-Known Artist,'' and attracted Colorado sculptor Dan Ostermiller, who donated his sculpture, a bronze bear sitting on a new tombstone as Beard finally got his due. Violet Oakley (1874-1961), from Jersey City, New Jersey, was the first prominent female muralist and stained glass artist. 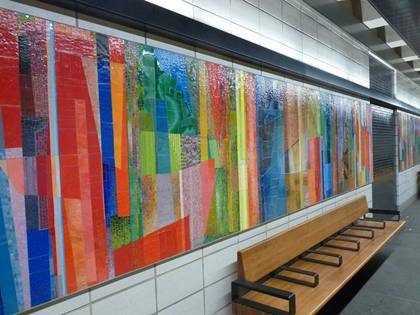 Her works include a series of 43 murals in the Pennsylvania state capitol in Harrisburg; two murals and stained glass work for All Angels Church, New York City; a panel in the living room of the Alumnae House at Vassar College; eighteen mural panels on The Building of the House of Wisdom and stained glass dome for the Charlton Yarnell House, 1910, at 17th and Locust Street in Philadelphia; and murals for the Cuyahoga County Courthouse in Cleveland, Ohio. 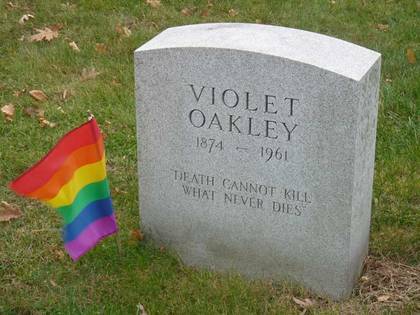 On June 14, 2014, Oakley was featured in the first gay-themed tour in Green-Wood and a rainbow flag can still be found on her plot. The time drew near to the closing of the gates at 4PM. I left Green-Wood and lunched at Burger King.